You are viewing mini cruises sailing from Southampton. Click here to see all 2019 and 2020 mini cruises. Southampton is the cruise capital of the UK. More cruise ships depart here than anywhere else in the country, perhaps as it is well-positioned to serve the south of England, Wales, and the Midlands. Southampton is flanked by the M27, which connects to the M3 leading to London’s M25. It also bridges the A33 and A34 which leads to the M4, for access from the midlands and South Wales. As for trains, Southampton has direct services to London, Oxford, Bournemouth, Fareham, and Cardiff, with connecting services to the midlands and the north of England. The port is so large it boasts four cruise terminals, which can be confusing to first-timers. City Cruise Terminal (Berth 101) is best for public transport passengers as it’s just a short walk from the train and coach station. It’s also within easy reach of hotels, including Holiday inn Southampton and the Grand Harbour Hotel, and for the sprawling West Quay shopping centre. Mayflower Cruise Terminal (Berth 106) sits just along the road beyond Rank Hovis’ Solent Flour Mills. The terminal itself isn’t as nice as City Cruise Terminal in my opinion, and it isn’t as convenient, but it is still just about walkable to the train station and city centre (I speak from experience). Ocean Cruise Terminal (Berth 46) is quite a trek from these two terminals. It sits close to Ocean Village on one side and the Red Funnel ferry departure point on the other. It is a hike from the train station so if you are taking public transport, you’ll want to opt for a taxi to the terminal. Queen Elizabeth II Cruise Terminal (Berth 38/39) is right at the very end of the road that leads off to Ocean Cruise Terminal. It sits opposite a multi-storey car park at the end of the pier, in front of Southampton Grain Terminal. If you are taking public transport, you’ll definitely want to opt for a taxi to the terminal. Driving to the port? Car parking is available at all four terminals. You might need to book a space with AB Parking or CPS depending on your cruise line. You’ll normally self-park and keep your keys when you book with AB Parking unless you book valet parking. As for CPS, they normally operate valet parking as standard so they’ll park your car and keep your keys. Third-party operators run car parks in and around Southampton should you wish to look for something a bit cheaper. There’s a public multi-storey car park at West Quay shopping centre that allows overnight parking for a really good rate. Some hotels offer ‘cruise and stay’ packages whether you can stay the night and then benefit from a period of car parking included in the deal rate, although these are usually only worthwhile for cruises of 7+ nights in duration. Southampton is conveniently located with excellent road and rail links to London, the South East, the South West, Wales, and the Midlands. There are plenty of hotels nearby for a pre- or post-cruise stay in Southampton. Some offer ‘cruise and stay’ packages that include one night in the hotel plus parking for the duration of your cruise. There is lots of car parking available at the port, but pre-booking is strongly advised to avoid a last minute hunt for an available space. Southampton is a major base for cruise operators, meaning a greater range of cruises on offer. 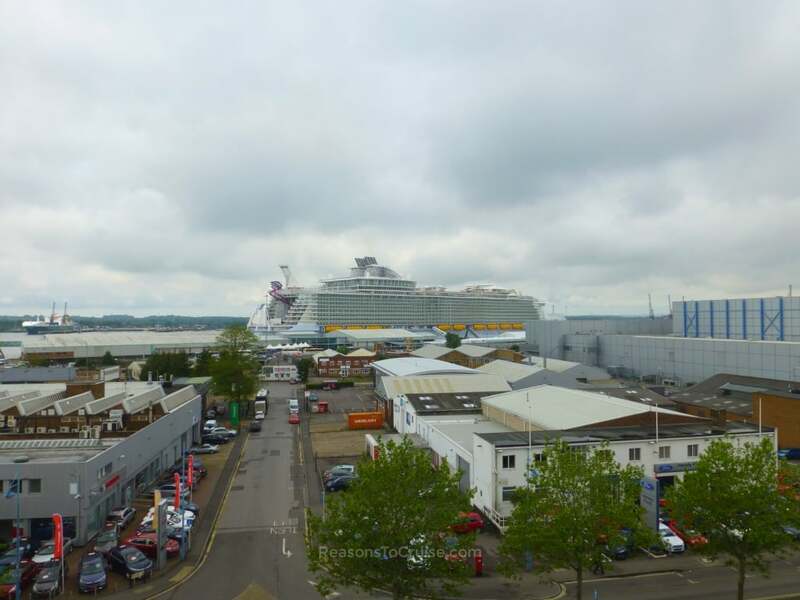 With four cruise terminals, Southampton’s roads can snarl up during peak times. Remember to allow for traffic jams and road closures. Car parking is at a premium in Southampton. As a guide, official on-site parking is around £10 to £15 per night. Car parking around the city is equally as pricey.